Taghazout Waters Edge Yoga and Surf Villa - Agadir, Souss-Massa Guests overall rating: ★★★★★ 5 based on 7 reviews. 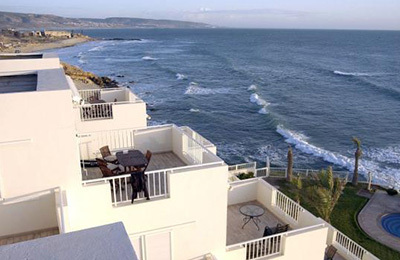 Taghazout attracts surfers from all over the world thanks to its perfect position along the moroccan Atlantic coast and the frequent surfing conditions boasting the best waves of the northern Africa ! The village has a lively atmosphere and the food. With a stunning view on the ocean, stylish luxury private rooms and comfortable budget options, Taghazout Waters Edge Yoga and Surf Villa offers high quality service at a fair price with weekly package including surf lessons, yoga, delicious food and a variety of accommodation. Situated in front of Hash Point one of the numerous surf spots along the moroccan Atlantic Coast boasting incredible waves thanks to a year-round swell ! The surfcamp is only few minutes driving from the best local surf spots : Hash Point, Panorama, Mysteries and more.. with something to challenge for surfers of all abilities. Premium room with luxury furnishing, ensuite bathroom and ocean front balcony with dining table.. Private Standard Plus rooms or Shared Standard with Wi-Fi and access to the whole surfcamp facilities.. Ocean terrace where you can have Vinasa style and Hatha flow yoga sessions.. The surf camps managers, staff and instructors are international and multi-lingual, so there is a really cosmopolitan feel at the camp. We will come to pick you up at the local bus station or International airport in Agadir. 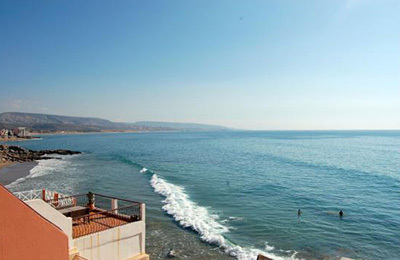 The Surf House can accommodate up to 25 surfers right on the ocean’s edge giving you unparalleled access to the surf ! 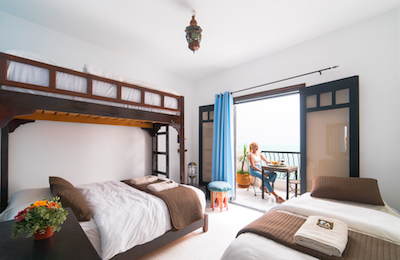 Built in traditional Moroccan style theTaghazout Waters Edge Yoga and Surf Villa offers beachfront accommodation in shared and private rooms with ocean view, free Wi-FI and delicious local cuisine with daily surf courses, surfaris and yoga. Premium Private room.. the most comfortable and premium accommodation that we can offer you at the villa! With ensuite bathroom, 2 big closets and a magnificent ocean view balcony equipped with dining table perfect for breakfast, lunch or a drink at sunset. Standard Plus Private rooms.. with amazing ocean view and a balcony equipped with dinner table and 2 chairs. We dispose of single, double and triple rooms with stylish furnishings in moroccan style. Standard Shared room.. twin or double cosy room with nice ocean view. Featuring : clean bed linen (provided), wardrobe, free wi-fi and two single beds and a complimentary bottle of water at your arrival. Standard Shared room.. with bunks bed and capacity up to 6 people, we can comfortably accommodate single travellers or group of friends looking for essential accommodation. Featuring: clean bed linen (provided), lockers and wi-fi. All The rooms are large and remain cool even in the heat of the summer. In addition to the room amenities described above, all Guests have access to an indoor cinema with a 3m x 2m screen, the yoga rooftop, board storage, shared lounges, and a large dining room. A daily fresh buffet breakfast is served every morning before getting to the beach for the surf course or surfari in Taghazout. You will be free to prepare your own packed lunch from the buffet. Once back at the camp, the evening we have dinner at the surf house with fresh products coming from the local markets, including moroccan and european cuisine deliciousness (Vegan and vegetarian options available!). The weekends, normally on saturday, we have the barbecue night ! With international quality waves within a short drive along the north and south coast, the Taghazout Waters Edge Yoga and Surf Villa will bring you surfing in the best spots of the area ! Thanks to the consistency of the swells the summer is a good period for beginners and intermediate surfers, meanwhile from november to march is perfect for Intermediate / advanced and experienced surfers! • Anchor Point : Known to the locals as Madraba, Anchor Point is not only the most famous surf point in Morocco but according to Surfer Europe is in the top 50 waves in the world. It is a very long right-hand wave that rises up to 6m and can be seen from the surf camp’s terrace. • Hash Point : Right beneath the windows and the terrace of the surf camp is this right-hander, within stumbling distance from your room. It rises to a maximum of 1.2m and is a great wave to surf between other sessions. • Panorama : Panorama is four minutes walk from the surf camp, and you can even paddle here! The wave rises to 1.5m and it’s fast even at low tide. • Mysteries : A right-hander that rises to 1.6m, Mysteries is a fast wave that breaks in front of a large rock. You need to be careful on the take-off, but for the rest of the ride it’s sandy underneath. • Killer : From May to June and in September to October you can surf here with the migrating killer whales! The wave has three long sections with a flat but rocky bottom, and it’s surrounded by caves and cliffs. • La Source : Next to Killer is La Source, and left- and right-hander wave that works only in high tide. Beware of the sharp rocks underneath. • Crocro : Crocro’s a great beach with lots of A-frame waves, which work best in high tide. It’s a popular spot for surfers and sunbathers alike, and you can grab a drink from the shore-side bars between your surfing sessions. • Devil’s Rock : This is a great wave, especially for those with long boards. It gets busy at the weekends, but if you can avoid the crowds you’re in for a great deal of fun. • Boilers : A 15-minute drive from Taghazout, this is the place to come if it is busy closer to town. It is a right-hander with hollow barrels over a sharp roof, and only really suitable for experienced surfers. Look out for the sea urchins and wet rocks. The morning from 7.00 – 8.00 (during Ramadan: 8.00 – 9.00) and the afternoon after the surf from 17.30 – 18.30 (during Ramadan 18.30 – 19.30) we have yoga sessions on the terrace overlooking the ocean ! With a certified yoga teacher from Hawaii who has traveled the world teaching yoga from India and Thailand until Morocco, you are more than welcome to take part to the yoga sessions. They are relaxing and suitable for everyone, especially for surfers willing to incorporate balance and breath following the teaching of Hatha flow. The class takes around 60 minute, Vinyasa style, including short meditation and breathing exercises. Our instructors lead classes of all levels with modifications for beginners and advanced postures for experienced yogis. As a mental health professional, Christina offers you all the benefits from her yoga therapy for mental and spiritual wellbeing. Involving the ancient art of yoga, the goal is to move your life into a more balanced place.. focusing on relieve anxiety, weaken depression, and bring you an overall sense of peace. The Taghazout Waters Edge Yoga and Surf Villa is located in the seaside resort town of Taghazout on Morocco’s Atlantic Coast. Became the moroccan surfing mecca in recent years thanks to its laid-back atmosphere and its history, this fishing village were colonised from Spanish during he 19th century, with a deep impact on culture. architecture and Taghazout’s way of life. The sea is the main attraction, and surfers and swimmers alike flock here in summer when the warm waters of the Mediterranean merge with those of the Atlantic, bringing water temperatures up to 21 C. Taghazout Bay is a burgeoning tourist resort, and the beaches stretch all of the way from here to Agadir, 15km to the south. The surf camp offer a range of activities (camel and horse riding, buggies safaris,etc) and regular excursions for guests, including day trips to Morocco’s capital Marrakech, where you can explore the medina (the Old Town) and also the souks (the markets). You might also want to visit Paradise Valley, an exotic landscape of cliffs, waterfalls and pools or Essaouira, a 16th century port famed for its pirates and seafood. 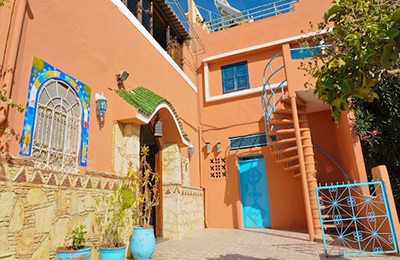 The Taghazout Waters Edge Yoga and Surf Villa is just 15km north of Agadir international airport and is well-served by flights international low cost flights airlines. The staff from the camp will be waiting for your at the arrivals to bring your directly at the doorstep of your room in less than 1 hour ! "Me and my sister had so much fun! We will be back:)"
"Had a wonderful stay with these guys as part of a private yoga retreat. We stayed at surf villa and it could t be more beautifully situated. Surfing lessons were well instructed and the whole team were friendly, Helpful and cousins do enough to make your holiday perfect. stunning view! 100 % recommended!" "MIss you guys, tne waves , the sun and the surf! Hope to be back soon!" "Seven days of relaxation and surf !! Thanks !!!" "The surfhouse is really great! I love this place! Such nice people, good surf teachers, lovely rooms and the food is excellent! They always bring you to the best surf spots. I will come back here"
"Thank you for a wonderful stay! Excellent instructors, great hospitality and all topped off with fantastic surfing and yoga. What more could you want? I would definitely recommend it to anyone wishing to have an authentic Moroccan experience." Best Week !! Thank you !! "Just wanted to say a MASSIVE thank you for having us (Louis's group!) this past week! We had an awesome week. Good food. Good surf. Good yoga. Great company. Made some amazing new friends and incredible memories! I will definitely we be back again!! Thanks to the whole surf house for everything! You guys are awesome!"